Cycad plants are handsome, palm-like plants (often referred to as palms) with legendary ancient ancestry in the plant kingdom. 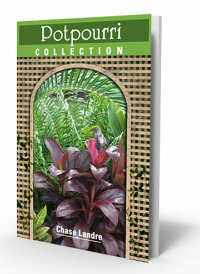 Today they're among the most eye-catching landscape plants in South Florida. Looking like a cross between a small palm and a big fern, cycads play an important role as easy-care plants that provide elegant form and tropical texture. The most commonly used varieties are coontie palm (zamia pumila) and cardboard palm (zamia furfuracea) - pictured at right - partly because they're two of the smaller cycad varieties. 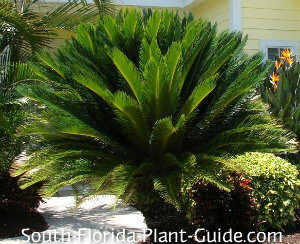 The gorgeous, deep-green king sago palms (Cycas revoluta) were extremely popular in South Florida, until about a decade ago when a viral form of Asian scale arrived in the United States and all but wiped them out. This cycad scale only affects the king and queen sago, not other cycads. Sagos are now available for sale again, and reputable nurseries will advise you when you buy a sago to use an oil spray such as neem oil on the leaves and surrounding ground if you see little white dots of scale start to form. 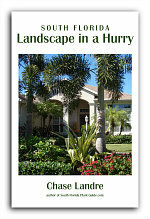 Because sago palms disappeared from landscapes, the scale problem has become more controllable. Most of these plants grow very slowly to a height of 3 to 6 feet, depending on variety, making them a good fit in any size yard. A cardboard palm can grow 5 feet tall and wide, though it takes many years. 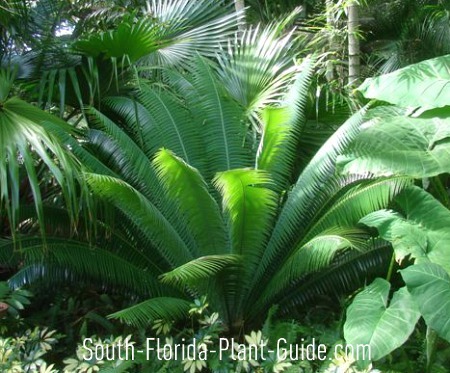 King sago palms can grow to 10 feet, but most seen in Florida landscapes today are generally less than 6 feet tall and wide. The queen sago palm (cycas circinalis) grows larger than the king, reaching possible heights of 12 to 15 feet, but this takes a really long time. Coontie can get to 3 feet tall and wide. Dioons can grow 6 feet tall and wide. Amazing cycads are often called "living fossils" since they have lived unchanged on earth - so the story goes - for over 200 million years, at a time when dinosaurs trampled or grazed on them. According to a new study, they've probably been around unchanged for a mere 5 or 10 million years...changes apparently took place when the continents broke apart. The blue-green dioon spinulosum (the larger of the two) and dioon edule are extremely beautiful - and sadly underused in home landscapes. Some cycads stay low to the ground all their lives. The dioon spinulosum and the king and queen sagos will eventually form a short, thick trunk. A cycad will form an unusual reproductive cone, usually in spring. They're salt-tolerant, drought-tolerant once established, and grow in full sun to part shade (dioon prefers some shade). 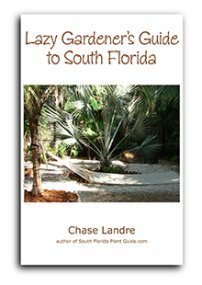 Cycad plants do fine in Zones 9 or 10. The queen sago can get leaf tip burn from cold but recovers quickly. The tips of the leaves are prickly on some varieties, so these work best when planted away from foot traffic or recreational areas. 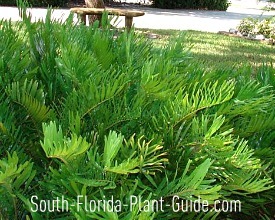 Plant in a well-drained area, since cycad plants don't like "wet feet." Water regularly but let them dry out between waterings. Add composted cow manure to the hole when you plant to enrich the soil. These plants rarely need any kind of trimming - other than to remove a dead leaf stem occasionally. Fertilize in spring, summer and fall with a slow-release, granular palm fertilizer. For the larger cycads, plant at least 3 feet or more apart to allow for the expansive growth (eventually) of the long "fronds." 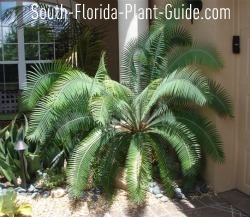 For larger cycads, come away from the house about 3 feet or more. Smaller ones can go as close as 2 feet. These make excellent container plants because they grow so slowly. 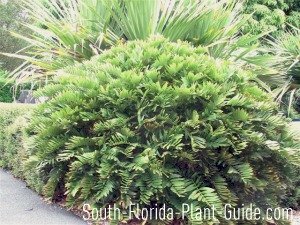 Coontie (sometimes called coontie palm) makes an excellent drought-tolerant shrub, so we've included it in the section on Small Shrubs. 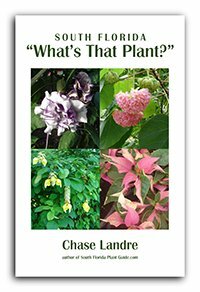 COMPANION PLANT SUGGESTIONS: Plant with other plants that like to dry out between waterings: orange bird of paradise, clusia, cocoplum, crown of thorns, yucca, and triangle palm.